I’m one of those people who take photos of food to post on Instagram. I make no apologies for this – it’s what Instagram is made for, but sometimes the application of a vintage filter on a perfectly normal photograph makes it look a little … different. Just take a second to look at the picture a little further down this page. Can you see a head? A grisly, charred, malevolent head? Horrific, isn’t it? Something, as one joker put it, out of Indiana Jones and the Temple of Doom. 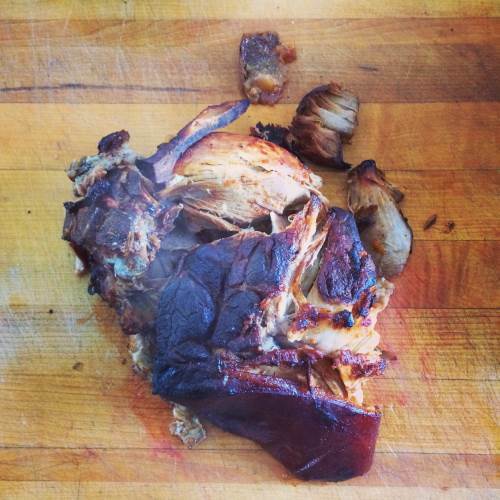 Be assured that it’s only a chunk of pork shoulder. There’s no need for an investigation or anything like that. It’s just a trick of the light, but as somebody on Instagram noted, it’s enough to turn you vegetarian, and whilst I’m never going to actually turn vegetarian, I see her point. 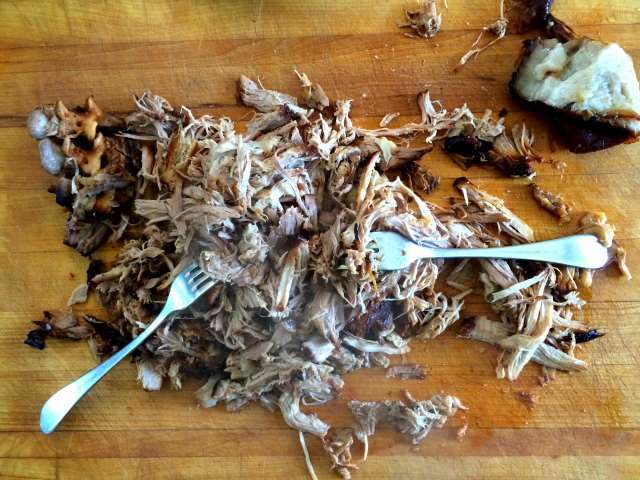 That piece of pork was rapidly torn apart with a couple of forks to form pulled pork, that oh-so-of-the-moment American dish that everybody, everywhere seems to be cooking and serving these days. It’s like lamb shanks for the twenty-teens. It’s a trend when the butchers in Kirkgate Market in Leeds have taken to writing little signs to stick into certain joints of meat saying ‘USE THIS FOR PULLED PORK’. There’s nothing particularly revolutionary about pulled pork, but do it right, and it’s very good indeed. Soft, tender, very tasty, perfect in a white bread role with a lot of spicy barbecue sauce and some token salad. ‘Doing it right’ is a matter of some conjecture, and the method I’m going to show you here will be seen as heretical by an awful lot of people because it doesn’t use a barbecue. The American concept of barbecuing is about as far removed from ours as it’s possible to be – where we try to cook meat to a delicate shade of blackened on the outside and raw in the middle, over fiercely flaming charcoal briquettes from a petrol station, the Americans go low and slow, using wood chips to stoke a gentle fire into producing delicately flavours from layers of smoke, often taking hours where we take minutes. Our once a year novelty is their art form. A joint of pork, cooked slowly for many hours over such gentle and flavoursome heat is definitely something to behold, something that you could confidently say has been ‘done right’ … but we’re not geared up for that type of cooking, either in terms of equipment or abundance of patience. So, if the idea is ‘low and slow’ heat, it makes sense that a slow cooker or a crock pot might just be a good alternative. Yes, you lose that delicious smokiness that only cooking over a wood fire can bring, but gain the convenience of having a meal cook in a ‘set and forget’ state. The basic idea here is to braise a large piece of pork in a slightly loose barbecue sauce for an extremely long period, up to ten hours. This means that cheap cuts of pork are very fair game – anything tough and unremitting is perfect for this type of treatment. I used hand of pork this time, which is a thick cut from very top of the foreleg, around the joint. It’s very cheap indeed – two big joints pushing about 3kg in weight for the pair of them cost about a tenner, but it needs cooking slowly and carefully to get the best out of it. OK, so a low braise it is, and that calls for something liquid. Pulled pork demands some sort of barbecue sauce to serve with it, so you might as well kick things off right from the start and make both at once. A simple barbecue sauce is really all that’s needed, and you may have your own recipe for this – personal taste is most definitely an arbitrator in this field – so go with what you want. Here’s a barbecue glaze that could be adapted easily, or you could make something more bespoke – 125g or thereabouts of tomato ketchup, about the same of water, a couple of tablespoons of both cider or white wine vinegar and brown sugar provides the perfect base for a decent barbecue sauce that can be modified and adapted to suit your taste. A teaspoon each of salt, paprika and dried mustard, along with a big pinch of ground cumin and a tablespoon and a half of Worcestershire sauce give things a bit of kick, kick that you can intensify with up to a teaspoon of chilli powder. A clove or two of crushed garlic and some finely chopped onion, perhaps half an onion, should round things out nicely. All of these are very loose measurements, so use them only as a guide. Simmer for about ten minutes and adjust whatever you like. Place a big piece of pork in a slow cooker, pour the sauce around it and set to high to get things going and then reduce the heat to low for as long as is necessary. It doesn’t matter if the sauce doesn’t cover the meat completely – just baste it now and then, and turn the joint over half way through. This is one of those dishes that should be started first thing in the morning for eating in the evening. The meat is ready when it falls apart. It should be virtually impossible to lift the joint out of the slow cooker in one complete piece. When the meat is out, pour the sauce into a pan and reduce over a very high heat to thicken. Let the cooked meat rest for ten minutes, covered in foil, and then shred it using two forks, pulling apart the fibres lengthways, so that the joint is reduced to a mass of steaming strings of pork. If you’ve seen a Peking duck being prepared at your table in a Chinese restaurant, that’s what to do. Serve the pork piled into bread rolls, with the thick, rich sauce spooned over. The cold leftovers make superb sandwiches, so it’s a good idea to cook more pork than you think you’re going to need. There you go. Hipster pork.